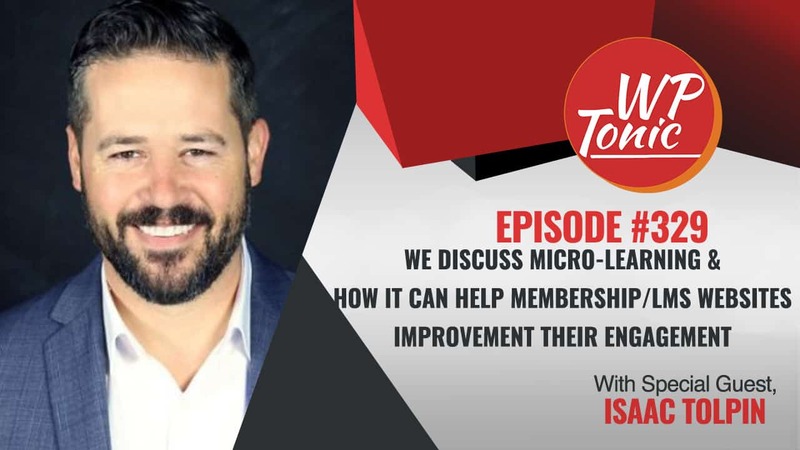 We Discuss Micro-learning & How It Can Help Membership/LMS Websites Owners Improve Their Students Engagement With Our Special Guest Isaac Tolpin of ConveYour.com. Isaac is a tech entrepreneur and futurist at heart, humanizing the digital training experience to equip and fuel progress for the learner. We live in a world where employees have a free agent mentality with changing motivations. The right culture is the deeper retention solution that lasts. Isaac has a unique understanding of how to craft and drive forward the right organizational culture that engages, retains, and boosts employee performance. Isaac is a co-founder of micro-learning solution ConveYour.com that’s the leading learning engagement platform for companies. Jonathan: Welcome back folks to the WP-Tonic Show. This is episode 329. I’ve really got a guest I’ve been looking forward to our conversation. That is Issac Tolpin from ConveYour. And Issac, would you like to quickly introduce yourself to the listeners and viewers of the show? Issac: Absolutely. Great to be here, first of all. I’ve been an entrepreneur most of my life, one of the founders of ConveYour.com, which is a microlearning platform and a family man. So that’s the most important thing right there. Jonathan: And he an RV fan as well. He’s been RVing for the past 3 months. And I’ve got my great co-host with me as well, Cindy Nicholson. Cindy, would you like to introduce yourself to the listeners and viewers? Cindy: Thank you, Jonathan. Hi everyone. It’s Cindy Nicholson from TheCourseWhisperer.com and I help entrepreneurs that are wanting to create online courses. Jonathan: And in this episode, we’re going to be discussing with Issac the whole area of microlearning. It should be a fascinating conversation. But before we go into it, I want to talk about one of our great sponsors and we really appreciate our sponsors. It helps with keeping the show going. And that’s WP Fusion. What is WP Fusion you ask yourself? Well, it enables you to communicate with two key elements of your technology stack and that’s WordPress and the CRM that you use to automate your email, SMS or anything else around Online Marketing. So, traditionally, it’s not always been that easy to get your WordPress website to communicate with your CRM. But with WP Fusion, it’s a breeze and it works with 40 of the leading CRMs on the market at the present moment. So basically, it covers almost all of them. And what it really does, if you’ve got a membership site, it really enables your membership site or your Learning Management System to really communicate with your CRM so you can really different messages to different people that are visiting your membership site and you can market target audience. Basically, it puts it on steroids. And the other great thing is WP Fusion has given an exclusive deal to WP-Tonic. If you go to their website and you’ll find links in the show notes and you use the coupon code WPTONIC, all uppercase, you will get 25 percent of any of the packages on the WP Fusion website and that is a fantastic offer that is only offered to the WP-Tonic tribe. So I suggest you go over there, buy one of their packages and just be blown away. There we go. So, Issac, we’re going to be talking about micro-learning. Would you like to give a brief outline of what is micro-learning and why it’s so important if you’ve got a membership site basically? Issac: Yeah. I would say it’s in the name. It’s shorter content to align with where human behavior is at. But I think it goes deeper than that because a lot of people misunderstand that, “Well, shorter pieces of content. That means I’m teaching less,” or, “My robust information takes a 15-minute video. Can I still do that?” And the answer is yes. It’s just to align with human behavior, we’re breaking it down and gamifying and doing some things that really attract people. Jonathan: So that was brief. 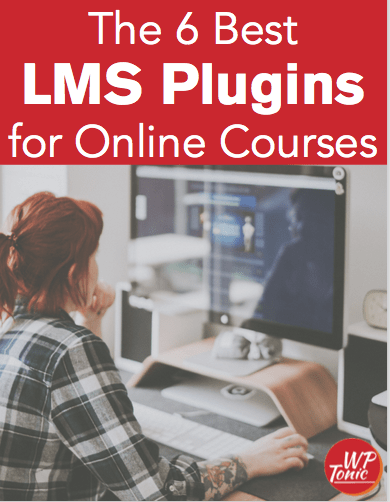 So what advice would you give to somebody that’s building an online course, membership site or those that have got an existing one, what are some of the key advice or some of the things you see people doing wrong maybe when they’re trying to develop their courses more in the microlearning methodology? Issac: Well, for somebody who has a membership site or they have courses out there, the first thing they’re going to notice if they’re looking at the data is people aren’t retaining very well. You’re losing members constantly. If it’s a course, you may not even be looking at it but most people don’t make it through a third lesson in a traditional course. Whether that’s Ivy League Colleges and they pay full price for those or it’s a trainer selling their information online or it’s a company unless the company’s making employees do it. And it’s just really important to realize that we’re in a YouTube world, Netflix world. We’re in a world where we can control what we consume and if it’s not interesting, we bail. And so, if you’re not developing things in the right way, there’s away five components I believe you need to be intact in a micro-learning lesson or series of lessons that create a course that really retain people. Because it’s one thing to get someone into a course. People can sell something. They can give something away. Companies can tell their employees to do something. But it’s a whole another-thing when we’re in the busy flow of life to get somebody back into it. Raise your hand right now, not really, but you know what I mean, if you’ve ever been to a course and you just loved the experience. Probably hardly anybody is raising their hand right now. And so, it’s really important to align that. Content is no longer King or Queen, if you’d rather. So the issue here is that sometimes we get so enamored with our content, we’re like, “My content’s amazing. People are going to be retaining it. It’s so good.” And frankly, it doesn’t matter how good your content is if you don’t have the other component. So what is King or Queen? It is great content with a great delivery mechanism that aligns with human behavior. And that’s where micro-learning is transformation because there’s really no other way to align with human behavior and we can talk about aspects that go into that. Jonathan: That’s sounds great. So you’ve got an actual company that actually helps with this. What are some of the key things that you think your company and its services offer to help with microlearning then Issac? Issac: Yeah. You mentioned learner trust I think before we started chatting. I’m glad you did because that is important. Learner trust is do they trust you’re going, when they come back to your learning that they’re not going to be bored, it’s going to be brief and it’s going to be valuable. But there’s other components that go into it to answer your question, which is nobody wants videos just talking at them anymore. What does everybody want today whether they realize it or not? They want an experience and if you don’t give them an experience, they’re going to bail. And what does an experience look like in a micro-lesson? Well, first of all, it’s going to have completion. Well, that’s basic. A lot of traditional platforms will have that where I do something and it completes so when I come back, it knows I’m on the next step now. However, if it takes 15 minutes to complete because the lesson is 15 minutes long or more, then you have a real problem. So everything has to be accomplished in a lesson, not just the video, the entire lesson, within 5 to 7 minutes and 7 minutes is getting long, so, it really needs to be brief. So, what has to happen within that 5 minutes, let’s say? They need to be taught something valuable, straight into the point, no fluff. People just want the information. We’re in a bail it world, right? I mean, go to the next thing. So, it’s got to recognize me for doing something. So we’re in a world where what happens on social media? We get recognized every time we do something, with a like, a comment, more people saw it, whatever the case is. And so, it’s got to be recognized, there’s got to be gamification and it’s got to engage me. I have to be able to engage with it, whether it’s answering a poll question, drag and dropping it down a 1 to 10 rating something, doing a collaborative answer where I can see everybody else’s answer afterwards. It’s got to have some kind of engagement and you’ve got to accomplish all of that within 5 to 7 minutes and the last piece to that is it’s got to be beautiful on mobile. It just has to be. So the big is a lot of these platforms are built for PC and make it work on mobile and really more people are on mobile so it makes sense now to actually build it for mobile but also make sure it works on those PCs over there. And that’s really important because you build software differently in the user experience if it’s built for mobile. And then, if you’re notifying people, this is really important. If you’re using just email, you’re going into a place where people feel guilty. So, if you’re having to do something that’s optional like consume your course, well, everybody, think about how many emails are in your inbox right now and if you have less than five, you are like not of this world. So, you are like an unusual person, which is cool. It’s good to be an unusual person. But most people have a big inbox. It’s constantly getting something there and it’s hard. So, if you’re notifying people by email of a new lesson, like you’re dripping out, which is a really powerful concept, to drip content out to people, you’re subconsciously adding to this guilty feeling they have with their inbox and as soon as a few of those notifications stack up and they don’t get back to your course, then they’re just going to kind of go, “This is too hard for me to take. I’m too busy right now.” And they’re going to delete those emails and probably not continuing that course. So we’re saying just in time notifications, real-time notifications, whether it’s a text message or in-app notification are much more powerful. Jonathan: That sounds great. I’m going to ask you a more kind of fundamental question. Obviously, you’re not an academic but you’re an entrepreneur and you’re really committed to online education Issac. Any of the research, do you think we’ve got a better idea about how actual children and adults learn fundamentally and why they don’t learn? Issac: Yeah. Wow. I love that question. It’s funny because I have seven kids and every one of them is unique and different and learn completely different. So, it’s really fascinating how different people are. In traditional education, frankly, I didn’t really fit into the mold, I felt, very well to learn in the classroom style, sitting there and just listening to information. So I’m more of a do it and experience things kind of person so I think that there’s tons of data out there on all the different learning styles. And that’s why in your lessons, you’ve got to hit all different kinds of people. There are people, by the way, that appreciate long-form content. There are those people. However, it’s just there’s a very small amount of those people, I think, that are going to spend that time. And so, some people might be listening and go, “Give me the longer video. On my own time, I’ll digest it,” and so forth. And I would say even with those people that are willing to go through longer form content, big written text and all of this stuff, the chances they actually get to it even if they like it are just slim. Whether we’re busy or not, we believe we are. There’s so many competing priorities today. I just think that all learning styles this fits really well with. Then again, I’m not talking about, let’s say you have a 15-minute video, I’ll give you guys an example, the doctor. This is kind of interesting because what more deep, important information would be training doctors where you can’t get that wrong? So, I was talking to a head of learning at a major hospital group that has actually 15 hospitals and he’s developing the E-learning. And it kind of transformed their thinking about this, which is, “Hey. Let’s lower our standards in some places just so that learning is actually happening because you can’t create an organizational culture. You can’t create a learning culture and drive it with learning unless you have enough learning happening because culture isn’t created by events. Jonathan: Yeah. I think I’m getting the drift there. That’s really an interesting answer. Thank you so much for that Issac. No. It was a really thoughtful answer. I can see where you’re going now actually with that actually. We’re going to go for our break and when we come back, Cindy’s going to take over and we’re going to delve some more into this fascinating subject of micro-learning. We’ll be back in a few moments folks. Jonathan: We’re coming back, folks. Issac’s been a great guest. We’ve had a good chat so far and the more intelligent side of the show is going to take over in a minute. Over to you Cindy. Cindy: Thanks, Jonathan. Hi Issac. Thanks so much for being here. Cindy: I don’t know if you’ve noticed while we’ve been on video I’ve been sitting here nodding my head vigorously to pretty much everything you say. Cindy: I’m an Instructional Designer so I’ve done tons of training and courses for people and I work with entrepreneurs right now and one of the biggest things that I have to help them with is to break their content down into little microlearning lessons. Cindy: They balk at the idea of having a 5-minute video. They have no idea how they can deliver it. And so, I’m just nodding my head because you can I speak the same language. Issac: I love it. That’s great. Cindy: It’s so awesome because I came from the corporate world where I was a corporate trainer and that was constantly my thing. How can we make sure that the people learn the material but then can apply it? It’s all about ROI for the training. So, anyway, I love everything that you’re saying, Issac. I love this business. So I’m actually curious because I kind of come from a training background. How did you get even into this field and doing what you’re doing? Issac: That’s a really interesting topic because I’m not an academic person necessarily. I’ve graduated College obviously. I was in direct sales for a long time of all things and I had two states, 32 physical office locations and at the end, I was doing about 10 million a year in revenue and I left that when I was doing very well. But what was interesting about that was we recruited College students and I was there for a long time. I developed lots of leaders and I had an organizational structure, about 100 leaders and it was very interesting to be in that because I really understood where human behavior is going, not only from my own experiences but being around so many young adults for such a long time and working with them. So that’s one thing which is not an academic background but a real deep experience background. I would say the next thing I did is I built an E-learning Agency and the reason I did that is because I’m a paid speaker and executive coach and I’ve done those things before as well. It’s just because I’m passionate about and found it really fun. I love impact and I thought, “What better way to build a company that expands the impact of these really amazing people with incredible information?” And so, we built it with 43 employees, with two video studios and we did the production side of E-learning on a publishing model where we take a cut on whatever they sold or their content for other courses. What I learned in that is there wasn’t any software we could use that aligned with human behavior and I was deep in this space talking to Deans of Universities and big publishing outfits to the celebrity influencers and all these people would fly out and I was deep into this and I’m like, “Why hasn’t somebody created something from the ground up that was built for the learner that aligns actually with where human behavior is and is going?” So that’s the geniuses. And so, I ended up closing that business down. I have a different business partner with ConveYour and we already had a profitable company with a different and things were going great and Steven an I decided to build ConveYour. So, kind of a different background but we got to a great place. Cindy: That’s fantastic. Well, I love how you just recognize that there was a gap because I kind of often feel the same way as well. We have the people who create the products but then there’s the learners and if you can get something designed for the learner, then that’s going to only reap benefits on both sides. So, I appreciate that because I’m always advocating for a really good learning experience. So, again, let’s kind of help compel these content creators to create microlearning. How do we convince them to do more bite-size learning? So, if somebody comes to you and says, “I have a lesson that I want to teach. It will probably take me about 20 minutes to deliver all of the content.” What is your advice and the reasons why you give your advice to do it more bite-size pieces? Issac: Yeah, exactly. So, we’re caught in this mindset that if it takes 20 minutes or something, then a lot of people are, “This is really good.” Let’s turn that into three microlessons. And say it’s 20 minutes. We’re going to get rid of 5 minutes of fluff. So now you’re done to 15 minutes. And so, I always say, “Hey. That takes more preparation. So doing less. Remember, the Gettysburg Address was what? Just a couple minutes and it’s one of the most famous messages, just in Gettysburg, right where Lincoln gave that message, incredible. So it’s on top of my mind. Sometimes it’s a little to do a smaller message but it’s more powerful. You want to speak directly to your audience. My advice too is like bring it down, look straight in the camera and talk as if you’re talking to one person. Because at the end of the day, there’s going to be one learning sitting in front of you. So you want to talk that way. You don’t want to talk as if you’re on stage like a platform speaker. You want to talk intimately to one persona and coach them and help them with whatever you’re teaching. I would say too is that you can still do the 15 minutes, it’s just going to be three microlessons and the benefit of that is that they’re going to complete sooner. So now, they can do a little bit now and in between something. They can do a little bit later and you’re more likely to get them to do it. Here’s an example I usually share with people is that when my first child, I was new Dad trying to figure this whole Dad thing out. I hadn’t been around kids very much in my life up until then. And she wouldn’t eat. Any parents who can relate to that. She wouldn’t eat anything. And so, I got the biggest plate possible, big white plate and I cut the piece of pizza into the smallest sliver I possibly could and I put it right in the center and I said, “I don’t know if you’re able to eat that. It’s kind of a big deal.” And she’s like, “Of course, I can eat that Dad.” And she eats it up. And long story short, at the end, she ate two full pieces of pizza as I continued to tell her that. I think the psychology of consumption is when we feel busy and overwhelmed, we can only take so much. And so, I think when we explain that to authors, they really get it and they buy into it pretty quick. Cindy: Yeah. No, I agree 100 percent in everything that you’re saying. For me too, it’s easier for the creator to go back and edit and change things if they’ve only little modules to take. But it’s also better for the learning because based on my own experience of participating in online courses, if I see a video that’s 20 minutes long, I’ll be like, “Okay. There’s no way I can do that right now so I’m out.” Whereas if you see smaller pieces, like, “Okay. I’ve got 5 minutes. I can go through this.” There’s just so many win-wins on both sides. Issac: Yeah. You say a very important point I want to touch on. That was really important. The longer your videos are and the more you put into your videos, the less relevant you’re going to be. Because just think about how much you invest in editing, all of this editing, all of this work, one little thing is wrong in that video, outdated, what’s the likelihood you’re going to go back and change it? Would you even remember that it’s outdated? Well, hey, people today, they get one lesson that has something that’s not relevant anymore, they think your whole thing is irrelevant now. And so, you hit on something so important that let’s take the friction out of the production and let’s count on a software to bring the videos to life versus all of the pressure being on the video production. Cindy: Yeah. I agree 100 percent. So, when you were talking about software, you mentioned gamification and I’d like to kind of talk about that a little bit more because, again, I think it is a huge element to help assist with the completion rates of courses. So, can you tell me what are some things that people can include as part of their course from a gamification? I don’t want them to be thinking it’s like video games. What is gamification and what are some examples of how you can incorporate in your course? Issac: Yeah. People really misunderstand when learning people say gamification, that’s for sure. LinkedIn. Everybody understands LinkedIn. Gamification is the percentage of your profile that’s filled out in the name LinkedIn calls it. I think I’m like an All Star right now because it’s 98 percent completed. And I’m telling you, over time, that’s probably motivated me my profile on LinkedIn. So, that’s gamification. It’s as simple as that. It’s the ability to engage maybe in a poll question afterward. So you asked what some of the things are. First of all, I really believe you’ve got to give an achievement currency. An achievement currency is literally points, as simple as points for completing something. You can give everybody the same points or you can give them variable points based on how they’re doing depending on the context. But you know what, if they get points and their name is on the leader-board, what have their parents instilled in everybody’s minds, most parents, is that your name means something. So our name is powerful. The FOMO of social media, Fear Of Missing Out, now, you’re tapping into that which is good because they don’t want to miss out what their name is associated with on a leaderboard with other people even if they have no idea who those people are. If they do know who there are, even better in the department of the company or something. So, you’ve got to do that. You’ve got to have some social learning in there. Social learning is literally, well, you can say the leader-board is an aspect of social learning because I can see other people and so forth. But also, one of the things we did was in a poll questions, instead of just answering a poll question, giving them immediate feedback instantaneously right on their device of how they answered compared to everybody else with anonymous percentages. So, “Oh, interesting. I’m in minority here in what I think about these four possibilities,” or, “Wow. Everybody’s thinking is the same. I’m not alone.” So, that’s really powerful. Or the ability to answer an open-ended question where there’s a box and I can type as much as I want. But afterward, I can see my name with my answer in a list of everybody else’s answers and obviously, the video would let you know that ahead of time, but that’s really, really powerful to have some of that social learning in there. I think another thing too is challenging people in variable points. I’m really into the competitive side, healthy competition. Some learning professionals are like, “Oh, they should give everybody the same points.” So, it’s like, “Oh, let’s give everybody the same trophy that played soccer.” I don’t really completely agree with that but that’s okay. I think we need to do variable points. It’s really compelling. Like let’s say they have, oh, here’s a big one that people appreciate, live training. How much do people actually retain from a speech? What is the behavior change after afterward because someone gave a speech? You know what? I have a lot of professional speaker friends and they will even confidentially admit to me very little behavior change happens when a company spends to hire them. It doesn’t mean it’s not a good thing. You’ve got to make this event great. They’ve got to have a good feeling afterward and all that. What if you could a reinforcement campaign where you dripped micro-lessons out to people after you spoke that now actually created behavior change with the principles you taught? And what if, on this last gamification tip I’ll give you guys is, you challenge them with a question, multiple choice, one right, three wrong and every time, first of all, measure the speed. So the faster you did it, the more point you got but you didn’t even actually really know that. What you did know is that every time you got it wrong, you lost 150 points and could keep choosing until you got it right. And boom, when you get it right, then boom, the speaker comes on for a 2-minute video of why that’s the right answer and then boom, I’ve got a different amount of points than everybody else on every question so the leaderboard is really diverse. Well, that was done at Capital One and 75 to 100 percent completion of an optional course. There were 30 lessons dripped out daily for 30 days with a text message notification every single time. So, if you ever think text message notification, I don’t want to send too many text messages, well, these middle managers of these big companies loved getting the text message on their phone and loved answering every day for 30 days because, on an optional basis, almost everybody did it. Jonathan: Actually, Cindy, we need to go wrap up. Jonathan: Hopefully, Issac is going to stay on. He has agreed to stay on and we’ll be continuing the discussion which you’ll be able to see on the WP website and YouTube channel. Issac, how can people find out more about you and learn more about you and your amazing product? Issac: ConveYour.com, C – O – N – V – E – Y – O – U – R.com and get a free little demo. Write your phone. I’ll text your phone and you can play with the dummy course that has different engagement formats. Issac Tolpin on LinkedIn or social media. Feel free to connect with me, even if we’ve never met. I’m totally cool with that. [email protected] if you want to send me an email or ask me any questions. Jonathan: That’s great. And Cindy, how can people find out more about you and what you’re up to Cindy? Cindy: Well, if somebody’s wanting to create an online course and need a little bit of help to put it all together, you can find me at TheCourseWhisperer.com. Jonathan: That’s great. And viewers and listeners, thank you for last month. It was the most biggest week for WP-Tonic ever. We had more listeners and viewers than any time in the history of the 3 years of the show. So thank you so much for your support. And basically, we’d love to get feedback from you so go to the WP-Tonic and tell us the kind of guests or subject you would like us to discuss or go to our Facebook page and leave a comment there and if you’re feeling very generous, go to iTunes and leave us feedback and give us a review through iTunes, that really does help the show. We’ll be back next week where we’ll have a guest, somebody in online courses giving you advice on marketing or around WordPress in general but somebody that will help you. We’ll see you next week folks. Bye.